Neighborhood Roofing is a G.A.F Authorized MASTER Commercial Roofing Contractor and a TAMKO PRO contractor. Specialize in residential and commercial roofs repairs and replacement. A trusted roofing company that has been in business for 40 years. 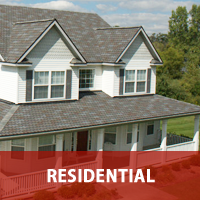 Whether you need a repair, a new roof, or a replacement roof, Neighborhood Roofing can help you through the process and give you options that fit your needs. Start the process now and request an estimate. A leak can start out small, and slowly cause a lot of damage if a warning sign is ignored. However, it can be much harder to pinpoint the cause of the leak. With winter comes dry air. Before you turn on your whole house humidifier, know the dangers to your home they can cause and what you can do instead. Whether it’s in warm or cold climates, proper attic ventilation plays a key role in helping to make the roof system last longer and prevent many expensive issues from occurring inside and out of a building.